Buttons are a fantastic example here. Pico says, press, release, light switch gets turned on, Hombridge gets informed. No dups. Is this whilst having HubConnect in debug? Again, I am not arguing, just saying I'm not seeing it as you are. I fully believe you're seeing what you show in the logs. I'm thinking there's one more hidden clue in this somewhere. Then I cant explain it then, whilst in websocket this is what I'm seeing. I change to HTTP and then just have this. Update to show on again, rather than off. @srwhite, I was going to push some more contact sensors from HE to ST today. Whenever I went to the Hubconnect app, I noticed that instead of my ST hub showing Online, it showed Warning. I have never seen that before and there was nothing in the logs that I could tell. What does that mean? I reconnected to server from both sides and Online is showing again. Warning is the intermediate stage between Online and Offline. It occurs when 'pings' from the Remote to the server don't arrive. Those 'pings' are over the LAN from hub to hub so communication should be absolutely solid. I do a LOT of testing, both of my own needs and of reports made here. I have never seen a hub go Offline that wasn't caused by me removing then re-adding (incorrectly) a hub. The recent update of v1.2 included order changes, that removed my tendency to add hubs with the wrong series of mouse clicks. The issue with the virtual hub devices not being created is a partial bug.. Success/failure depends on the order of steps that a user takes. Tomorrows update will have this fixes so that virtual hub devices are consistently being created when a new hub is connected. I've also added improved key exchange error handling, the ability to disconnect hubs, and some other fixes. @csteele is doing some final testing on the 1.2 release. 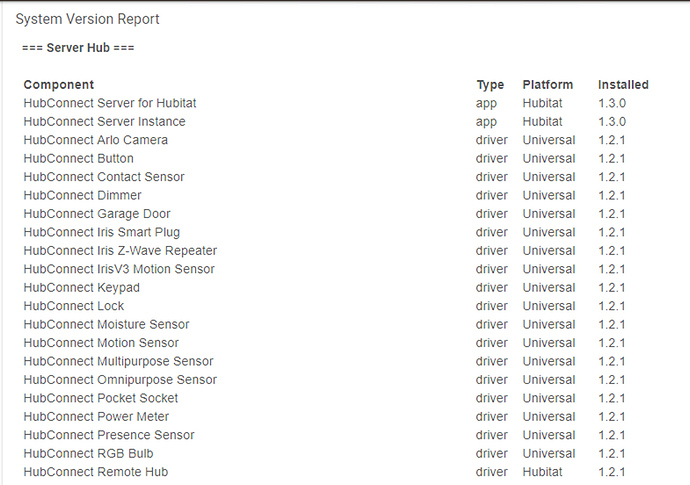 On my first floor hub one of my Aeotec MS6's is not auto syncing with the controller hub. When I go to the device on the controller and click "sync" it updates. No oddness in either set of logs that I can see. I am using event socket to connect and did do a firmware update yesterday which rebooted both hubs. I am using a custom driver and the omnipurpose HC driver. Further note - set the driver to stock, changed lux reporting to 10 and still no updates (morning here so illuminance is increasing). Update: Removed device on controller and then went to the client and went into sync devices and clicked done (also unselected/selected device again to be sure). Device recreated and seems to work now. Are we getting closer to working on user drivers yet? I have not seen this behavior, however I am completely convinced that it's not a HubConnect issue. All that happens when the eventsocket is used is that Hubitat listens for a new event on the socket and calls the parse() function. I have not seen duplicate events at all and I've got hundreds of devices. All of those functions are transparent to HC. Either something on the remote hub is generating duplicate events or creating phantom events on the websocket. It's also possible that something on the receive side of Hubitats socket implementation is causing parse() to be called more than once for the same event. What I have noticed is that after about a week or so there seems to be a bit of a lag in websocket performance. When I returned from my trip late last night I noticed my cross-hub automations were at least delayed by at least 5 seconds. I plan to add some code to refresh the socket connections at 24 hour intervals in the next release. I was going to push some more contact sensors from HE to ST today. Whenever I went to the Hubconnect app, I noticed that instead of my ST hub showing Online, it showed Warning. It means that there are missed communications between your remote hub and the server hub. Can you check your debug logs to see if any errors are being generated? That'll be out Q1 2020. Now that I think about it, I had just rebooted my HE hub. It may not have had time to reconnect when I saw it. Once I went into the App and reconnected, it was fine, and has been ever since. If I see it again, I will be sure to let you know if I see anything in the logs. Please do! I’m still going to add the option to refresh the sockets in the next release in response to the lag I saw last night. That was fixed by reconnecting. But yes if that comes back let me know. 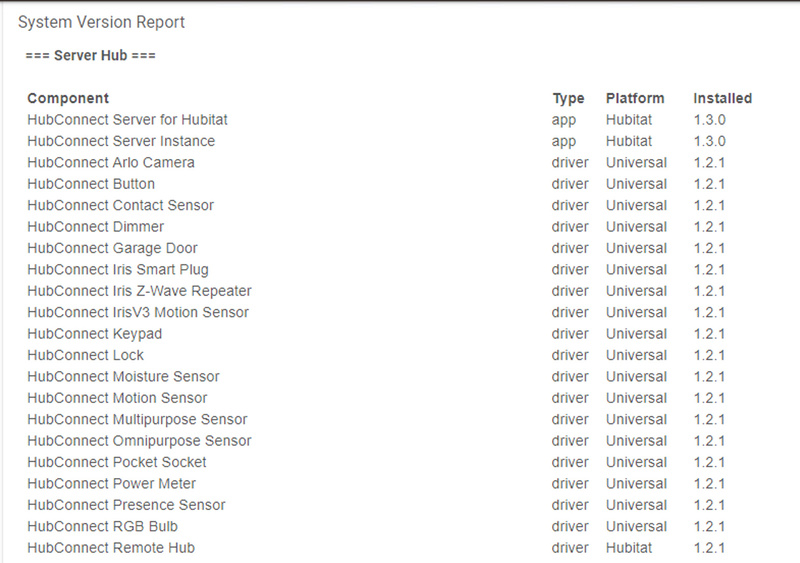 New Ecobee Suite support for HubConnect! Users of my popular (and FREE) Ecobee Suite for SmartThings can now fully control setpoints, thermostat mode, fan mode and the currently running schedule from the reflected SmartThings device within Hubitat. Please see the Ecobee Suite Thermostat v1.6.24 update notice (on the SmartThings Community) for more information. N.B. Currently my Ecobee Suite is only supported on SmartThings. With the impending availability of a Hubitat mobile UI, I do plan to begin natively supporting both platforms. Would love to explore an ‘MQTT online’ option too. I’ve been thinking about that, now I must look into the MQTT HomeBridge plugin capabilities. Your going to tell me it’s just a ‘spoof’ name for a Hubitat Hub now aren’t you ? Bi-Directional Mode Support. Remote hubs can now send mode changes to the server, which then pushes them out to all remotes. This is configurable on a per-hub basis. 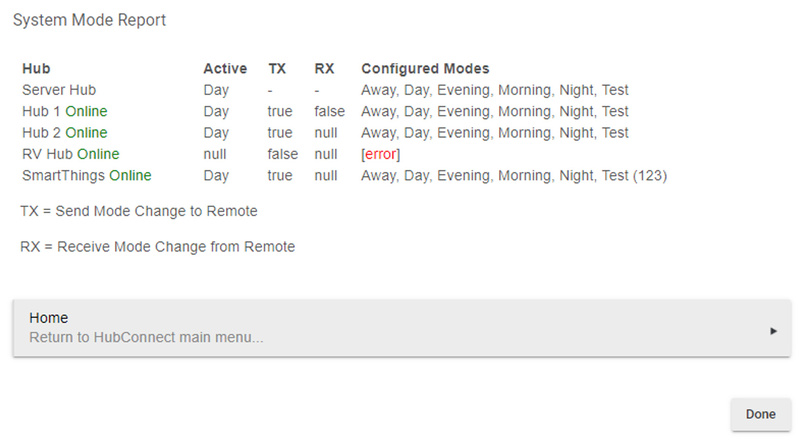 Note: The error is because my RV hub is not running the latest remote client. I've left this to demonstrate the behavior for hubs not updated or reachable. I'm not even a month into switching to HE, and I'm already considering getting a second hub.....to be a coordinator hub, to solely run just the apps and wifi/lan/IFTTT devices, and have my current hub solely for zwave/zigbee devices. My question is what would be the best process to do this with the least amount of frustration, as being I have Schlage locks that were/are a PIA to get paired properly and I really do NOT want to experience that process again, I was thinking this route and tell me what you think or what I may have wrong?